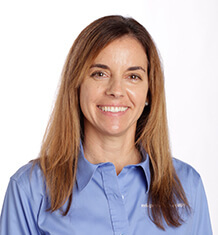 Christine began practicing Physical Therapy in 1999, and has been with MTI Physical Therapy since 2002. Preparing for graduate school, Christine completed her degree at the University of California Santa Barbara (UCSB) and then moved to the Netherlands for physiotherapy training. Physiotherapy training includes manual technique, as well as extensive massage training in addition to the physical therapy portion of the degree. She completed her postgraduate training in manual orthopaedic physical therapy in Oregon through North American Institute of Orthopaedic Manual Therapy in 2003. Christine is a proud mom of two children, and continues to enjoy teaching at the parent baby group at Evergreen Hospital as well as coordinating treatment with local doctors and midwives for return to activity post partum. Currently Christine utilizes Pilates, Yoga, Feldenkrais, and functional body movement with postural training as part of her exercise regimen, catered to each individual. The main goal in addition to resolving injury and symptoms, is to treat the entire kinetic chain, and provide independent tools to not only maintain success, but to prevent the return of the symptoms. Patients also benefit from education and training exercises in order to reach personal goals without injury.